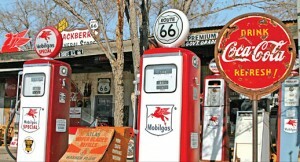 Of all the road trips in all the world, none is more famous than Route 66. Covering a massive 2248 miles from Chicago to Los Angeles, this epic coast-to-coast has become synonymous with vintage Americana, the open road and freedom. Historically known as ‘The Main Street of America’, Route 66 passes through a collection of iconic North American locations including Springfield, Amarillo and Albuquerque. Although 66 no longer technically exists, visitors follow its historic route every year on a combination of highways which trace its original path. Whether you take a coach trip or an open-top Cadillac, classic USA tours in 2012 don’t get any better than this. Order a slice of blueberry pie at a vintage diner, book into a back-of-beyond Motel, and make yourself a playlist of Country, Rock and Roll and Blues for the open road. The route was first opened in 1926 and has since earned its place in the highway hall of fame. Literature and music have lamented and raved about it, with John Steinbeck naming it ‘the mother road’ in his iconic novel The Grapes of Wrath. The original American highway, 66 passes through the Mid West, Great Planes and South West. As described in The Grapes of Wrath, families travelled this road to the west coast in search of a better life during the great depression of the 1930’s. Thanks to the TV show Route 66 and a mention in Kerouac’s novel On the Road, the route has a long standing place in popular culture, and has become a rite of passage for road trippers and young adventurers following in the footsteps of the beatnik generation. For many the road has come to represent freedom, drawing thousands to make the trip every year. Gas stations and vintage 50’s diners have been preserved on the route, so many stretches look the same as they did in their heyday. 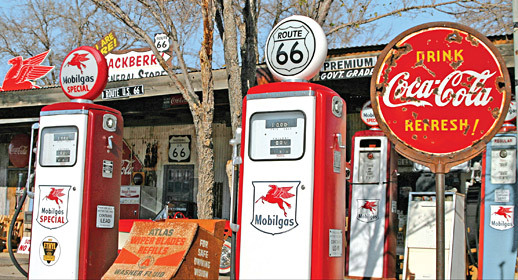 Old signs and adverts are examples of classic Americana and memorabilia, with traditional Motel Signs, petrol pumps and general stores adding plenty of old time charm. Waitresses serve traditional fruit pies in remote highway diners and just when you think you’ve found the definitive American Motel, another one comes along. The scenery passed on Route 66 is a huge part of its appeal, the landscape changing dramatically from the cosmopolitan bright lights of Chicago through the Great Plains and on to copper desert. Road-side attractions, restaurants and farmland prevail throughout Illinois and Oklahoma, whilst art and architecture define the New Mexico stretch. Further west come the great stretches of open road void of civilisation, which for many make the drive so liberating. Arizona is alive with wild beauty, including the Petrified Forest National Park. The route also skirts close to the Grand Canyon- an essential stop off on any USA adventure. 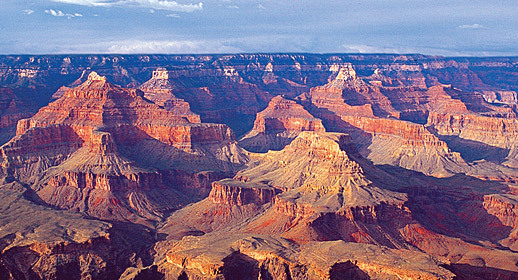 The Canyon is one of the world’s most impressive natural wonders and is a staggering 15 miles wide and 6,000 feet deep at its most extreme points.